We’d love your help. Let us know what’s wrong with this preview of Steering Toward Normal by Rebecca Petruck. Eighth grade is set to be a good year for Diggy Lawson: He’s chosen a great calf to compete at the Minnesota State Fair, he’ll see a lot of July, the girl he secretly likes at 4-H, and he and his dad Pop have big plans for April Fool’s Day. But everything changes when classmate Wayne Graf’s mother dies, which brings to light the secret that Pop is Wayne’s father, too. Sudd Eighth grade is set to be a good year for Diggy Lawson: He’s chosen a great calf to compete at the Minnesota State Fair, he’ll see a lot of July, the girl he secretly likes at 4-H, and he and his dad Pop have big plans for April Fool’s Day. But everything changes when classmate Wayne Graf’s mother dies, which brings to light the secret that Pop is Wayne’s father, too. Suddenly, Diggy has a half brother, who moves in and messes up his life. Wayne threatens Diggy’s chances at the State Fair, horns in on his girl, and rattles his easy relationship with Pop. To ask other readers questions about Steering Toward Normal, please sign up. Steering Toward Normal is the story of thirteen-year-old Diggy Lawson who competes in the annual 4-H cattle showing in Minnesota, which involves properly feeding and grooming of a baby steer for a year. But his plan gets thrown on it's head when Wayne, a schoolmate, gets dumped in front of his house by his drunken father, claiming that Diggy's dad is also Wayne's. This story weaves contemporary family struggles with the culture of 4-H, really delving into the finer points of cattle raising, which Steering Toward Normal is the story of thirteen-year-old Diggy Lawson who competes in the annual 4-H cattle showing in Minnesota, which involves properly feeding and grooming of a baby steer for a year. But his plan gets thrown on it's head when Wayne, a schoolmate, gets dumped in front of his house by his drunken father, claiming that Diggy's dad is also Wayne's. This story weaves contemporary family struggles with the culture of 4-H, really delving into the finer points of cattle raising, which might not be a topic that would appeal to everyone, but it was a topic written with such confidence and knowledge that I was immersed. It's a small town story, and in true fashion, everyone knows everyone else and all their lives intermingle on some level. I was impressed by how well the author was able to handle so many characters and give each their own unique voice and story. Even though the book is being marketed as a humorous MG--which there were plenty of pranks and cow flops--it's true strength lies in the sincerity and depth of the relationship between Diggy, Pops (Diggy's dad), Wayne, and Graf (Wayne's dad). It was truly heartbreaking to see what Wayne had to endure--his mom is dead, his father abuses him emotionally, and Diggy is reluctant to accept him as a brother. But it was equally heartwarming to see Diggy eventually offer to teach Wayne how to raise a steer of his own, despite him being competition for the $13,000 top prize. Despite the book's regional and country topics, it's universal themes of acceptance and family should appeal to a much larger audience outside the world of 4-H. There are so many things I loved about this book that I can't possibly tell them in any coherent matter. 1. HUMOR. Humor is used EFFECTIVELY! I actually laughed out loud while reading this novel. And two of those times were within the last fifteen pages! I can't tell you what made me laugh, because I can't spoil anything that close to the end! But I will tell you it was the last line of chapter 32 that did it. 2. CHARACTERS. I read WIPs and books where the main characters have severe There are so many things I loved about this book that I can't possibly tell them in any coherent matter. 3. CLEAR CHARACTER MOTIVATION. No matter what happened in Diggy's life (and a LOT was happening), he was always concentrating on a single goal: Getting his calf, Joker, to the state fair and winning Grand Champion. Sometimes Diggy had to focus on other aspects of his life, but that thread remained strong and pulled me forward. 4. UNCLEAR CHARACTER MOTIVATION. The dads in this were incredibly nuanced. I asked myself why they did the things they did, why they acted the way they did. There wasn't always an answer, but that made them believable. 5. COOL DETAILS. I'm never looking at livestock at a fair the same way again. Or steers, for that matter. I absolutely loved the storyline to this book and all the characters in it! I went into this book blind and loved every minute of it. The symbolism in this book was just amazing and some of the twists you would never see coming. The characters relationship with each other grows slowly throughout and it really was enjoyable. Diggy Lawson likes his life in Minnesota-- he lives with Pop, having been abandoned by his mother as a baby, but he enjoys living in the country and raising steers for 4H and the state fair. When Wayne Graf is suddenly dumped at his house by Mr. Graf, who (reeling from the recent death of Mrs. Graf) thinks that Wayne is really Pop's son as well, thinks don't go quite as well. While Wayne has a huge extended family who would like to take him in, Wayne (who is actually Pop's biological son) wants Diggy Lawson likes his life in Minnesota-- he lives with Pop, having been abandoned by his mother as a baby, but he enjoys living in the country and raising steers for 4H and the state fair. When Wayne Graf is suddenly dumped at his house by Mr. Graf, who (reeling from the recent death of Mrs. Graf) thinks that Wayne is really Pop's son as well, thinks don't go quite as well. While Wayne has a huge extended family who would like to take him in, Wayne (who is actually Pop's biological son) wants to stay with the Lawsons until Mr. Graf can get his alcoholism under control. Wayne also decides to raise a steer, so the boys are pitted against each other. For the most part, they get along okay, playing pranks on Pop and working with their steers, but Wayne is determined to find Diggy's mother, since he still misses his own so much. This causes tension between the two, but they manage to work out their differences and learn a lot about what "family" really means. Wayne and Diggy are surprised to find that they have the same father. This story gives readers a look at motherless boys and their Dad. Wayne does have a "Pop" (father who raised him), but he moves in with his biological dad when things get rough at home. The majority of the story is about raising steer for 4-H and state fair competition. Things get interesting with the new family dynamics, especially when girls that the boys have known for years are maturing and start "acting different." A fun Wayne and Diggy are surprised to find that they have the same father. This story gives readers a look at motherless boys and their Dad. Wayne does have a "Pop" (father who raised him), but he moves in with his biological dad when things get rough at home. The majority of the story is about raising steer for 4-H and state fair competition. Things get interesting with the new family dynamics, especially when girls that the boys have known for years are maturing and start "acting different." A fun book to read with cattle vocabulary and instructions for pranksters in the back! I loved this book, the end. In Rebecca Petruck's debut middle grade novel, she has managed to write a book that both boy and girl readers will enjoy. Incorporating 8th-grade humor, Rebecca also deals with hard, emotional issues of death and abandonment. I could see why it was chosen as one of the top 10 children's debut books by the American Booksellers Association! I predict that librarians, teachers, parents--and most of all kids-- will eat this book up! Here is more of a review using "Save the Cat" by Bla In Rebecca Petruck's debut middle grade novel, she has managed to write a book that both boy and girl readers will enjoy. Incorporating 8th-grade humor, Rebecca also deals with hard, emotional issues of death and abandonment. I could see why it was chosen as one of the top 10 children's debut books by the American Booksellers Association! I predict that librarians, teachers, parents--and most of all kids-- will eat this book up! Steering Toward Normal opens with Diggy Lawson preparing to welcome the calf he will raise this year. He is mentally preparing himself not to get attached to the steer by naming him. He knows that in just over a year the steer would become steak. "He was an experienced cattleman now. No names, no tears. An eighth-grader shouldn't cry." (p. 2) Despite his resolve, he names the steer "Joker." "Wayne looked up at Pop, his face intent. 'Did you know my mom?'" In the first 10 pages of Steering Toward Normal, the reader meets Diggy and discovers his over-arching goal to win Grand Champion at the State Fair. His crush, July, won it the previous year and is expecting him to follow in her footsteps. He pledges to win it for her. When Diggy's father, Pop, tells Wayne to come inside the house, the boy demands more information about his mother. "Wayne jerked away. 'My dad's type A, and I'm B!" he shouted like an exclamation. Diggy barely heard Wayne add, 'He says you're my dad, and I have to live here now.'" (p.14) From this point on, Diggy wonders if and when his life will return to normal. After a while Diggy couldn't stand it anymore. "You're letting him stay." On p. 76, after a heated discussion with Pop over Wayne staying, Diggy hoses himself down. He wants to cleanse himself from his father's touch; and escape from Wayne who has been thrust upon him as his half-brother. But he can't run away--he's in a new world now. Rebecca helped me figure out this one. I had thought the B-story was Diggy's crush on July. But she said it's the off and on relationship of Diggy's 4-H friends, Crystal and Jason. The fact that they finally choose one another as girlfriend/boyfriend reflects how Diggy and Wayne will end up choosing to be family. In Steering Toward Normal, the fun and games include Diggy's obsession with rocket building, Diggy and Wayne playing pranks on each other and on Pop, and the boys staying up late and watching B-movies. Woven throughout is their grooming and training their calves in preparation for the county fair. In Chapter 14 (pp. 126-136 out of 317 pages), Wayne raises the stakes by thumbing through old yearbooks in their school library. He finds pictures of Diggy's mom and begins to demand that Diggy try to find her. Wayne persists in trying to get Diggy to contact his mother's family. Diggy wants to be angry with him but empathy for Wayne is growing and Wayne is making him see things he has ignored. "She could have left you with her parents," Wayne said. But then... Wayne admits that he's tried to contact Diggy's maternal grandparents and Diggy blows up. "Haven't you noticed, Wayne," Diggy sneered, "you only care about finding my mom when your dad screws up?" At the county fair, Diggy is a pile of nerves but Joker wins Grand Champion. Afterwards Diggy reflects on the fact that everyone-including Wayne, Pop, and Graf helped him groom Joker--despite the fact that only immediate family was supposed to help him. After the State competition, the boys discuss Wayne's pursuit of Diggy's mother. Diggy says, "Finding my mom won't bring your mom back." Wayne breathed deeply. When he looked at Diggy, he had tears on his cheeks. "I wish it could." In this interchange, Diggy empathizes with Wayne and shows true compassion and acceptance of his half-brother. This book is about an 8th grader named Diggy who is apart of a programmed called 4H. 4H is a program that provides cattle and farm animals for kids to show at competitions. Diggy raises his cow Joker for his 8th-grade year. Diggy's goal is to win grand champ at the state fair. One day Diggy's classmate Wayne gets dropped off at Diggy's house Wayne explains that his grieving dad found out that he wasn't Wayne's dad, Diggy's dad was. So now Diggy has to get along with a kid in his grade as his br This book is about an 8th grader named Diggy who is apart of a programmed called 4H. 4H is a program that provides cattle and farm animals for kids to show at competitions. Diggy raises his cow Joker for his 8th-grade year. Diggy's goal is to win grand champ at the state fair. One day Diggy's classmate Wayne gets dropped off at Diggy's house Wayne explains that his grieving dad found out that he wasn't Wayne's dad, Diggy's dad was. So now Diggy has to get along with a kid in his grade as his brother. To make matters worse Wayne wants to raise a cow too and compete at the state fair. Rebecca Petruck’s Steering Toward Normal is a fun coming of age middle-grade contemp with a lot of heart, humor, and cow poop! With two different, yet likable male leads, and a world I’ve never ventured into before (go 4-H Club! ), Steering Toward Normal captured and amused me greatly! 13 year old Diggy has big plans for his eighth-grade year: he’s picked out a great calf to raise and compete with in the next State Fair, he gets to see his crush, July, at 4-H meetings, and he and his dad, Pop, hav Rebecca Petruck’s Steering Toward Normal is a fun coming of age middle-grade contemp with a lot of heart, humor, and cow poop! With two different, yet likable male leads, and a world I’ve never ventured into before (go 4-H Club! ), Steering Toward Normal captured and amused me greatly! 13 year old Diggy has big plans for his eighth-grade year: he’s picked out a great calf to raise and compete with in the next State Fair, he gets to see his crush, July, at 4-H meetings, and he and his dad, Pop, have plenty of pranks to pull on one another. But then everything changes when Mrs. Graf dies and her son, Wayne, one of Diggy’s classmates, turns out to be Pop’s son too. A distraught and alcoholic Mr. Graf kicks Wayne out and sends him to live with Diggy and Pop. Wayne disrupts Diggy’s easy life and big plans, but with the help of some steers, bad movies, and epic pranks, the two slowly learn to be brothers. I may live in NC, but I’m no country girl (just the thought of cow poop makes me grimace) and I’ve never set foot into a 4-H club or State Fair animal competition, but after reading Steering Toward Normal, I’d love to attend both! This heartfelt and honest story is full of lots of laughs, sincere characters, and a vast amount of info about a topic I never knew I’d actually enjoy and find interesting: raising steer for competition. Told through an endearing and entertaining middle-grade voice, Steering Toward Normal captures adolescence and all its bumpy obstacles wonderfully! While still appropriate for its intended audience, this book doesn’t shy away from the hard stuff (alcoholism, heartbreaking crushes, grief, discovering your parents aren’t all-knowing perfect people, etc), and Petruck explores these things with the complexity, depth, and realism they deserve. But I like that, even though the characters experience some really tough stuff, the book’s tone never gets dark; there’s always a sense of liveliness and hope within the pages! Diggy and Wayne are both endearing, genuine characters, and I really liked them as individuals and as a brotherly pair. Diggy, especially, was a lot of fun to get to know and I greatly enjoyed his funny, frank perspective. Petruck’s adult characters are also carefully crafted and feel refreshingly real and believably flawed. The world of 4-H clubs and animal raising/competing was completely new to me, but luckily Petruck clearly knows her stuff! I learned a lot about this apparently popular world and was surprised by how fascinated by it all I actually was. Petruck does a beautiful job of showing how Diggy and Wayne’s emotional journey and journey to the State Fair are integral to and affect one another. Thirteen-year-old Diggy Lawson has already shown his steers in several competitions at the county and state fairs in Minnesota but this year is supposed to be an important year for him. His competitor, July Johnston, is older and will not be taking any animals to the fair this year so Diggy has made it his goal to raise a steer that will win grand champion at the state fair. Diggy’s family members are just he and his Dad, Pop, since Diggy’s mother abandoned them when he was just a baby. They hav Thirteen-year-old Diggy Lawson has already shown his steers in several competitions at the county and state fairs in Minnesota but this year is supposed to be an important year for him. His competitor, July Johnston, is older and will not be taking any animals to the fair this year so Diggy has made it his goal to raise a steer that will win grand champion at the state fair. Diggy’s family members are just he and his Dad, Pop, since Diggy’s mother abandoned them when he was just a baby. They have a good relationship and all is well until one day Wayne Graf’s father literally “dumps” fourteen-year-old Wayne in their drive and leaves. Diggy thinks that Wayne will be with them only for a short time but soon weeks have passed and Wayne has not gone home. Wayne’s mother has died and Diggy soon learns that Wayne’s real father is Pop Lawson who is also Diggy’s father. Eventually, since Wayne is becoming like a member of the Lawson family he joins 4-H and gets a steer to raise and show at the fair. Because they are sharing a home and a father, trouble soon brews between Diggy and Wayne as they both search for a resolution to their feelings regarding their parentage and their friendship. 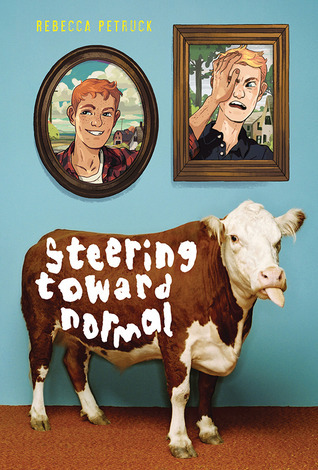 Steering Toward Normal is an excellent title for this book since the 4-H steer projects help Diggy and Wayne resolve the emotional issues that they are facing as a result of the recent turn of events. This book is a wonderful read for the middle grade boy especially for one who can relate to the 4-H fair experience. The novel provides a good description of the essential efforts involved in preparing an animal for a fair competition. The details allow the reader to understand the intensity of the process but don’t overwhelm the story line. How people deal with losing a loved one through death or abandonment is another theme that runs through the plot. The author includes believable events in the telling of the story that reveal how the characters grow and how they learn to cope with their losses. I have attended many county fairs but have never participated in a 4-H project. I certainly gained a better understanding of the experience by having read this book. This review is from an ARC courtesy of NetGalley. When Diggy was one month old his mom left him in a laundry basket on Pop's (everyone calls him Pop's) doorstep and went riding out of town on his tractor. Diggy really hasn't given her another thought, until Mr. Graf shows up one day and drops Wayne on Pop's doorstep telling him that he's Wayne's dad. Apparently the whole thing came to light when Mrs. Graf died recently. Just in that little piece, you really get a feel for the plot, but there is so much more to it then just that. Wayne and Diggy When Diggy was one month old his mom left him in a laundry basket on Pop's (everyone calls him Pop's) doorstep and went riding out of town on his tractor. Diggy really hasn't given her another thought, until Mr. Graf shows up one day and drops Wayne on Pop's doorstep telling him that he's Wayne's dad. Apparently the whole thing came to light when Mrs. Graf died recently. Just in that little piece, you really get a feel for the plot, but there is so much more to it then just that. Wayne and Diggy come at the story from two very different perspectives but they really have more in common then even they know. Wayne is the boy who losses his mom to Cancer and has a father so wrapped up in his grief that he takes to drinking and does and says really hurtful things to his son. Diggy is the boy who's mom may still be alive but she has never sought him out. You just want to reach out and hug these two boys. Petruck does a wonderful job of balancing the weightiness of the plot themes (alcoholism, death of a parent, abandonment) with humorous pranks that the boys and Pop play on each other leaving room for jealousy, fun sibling rivalry and good old fashion fighting. Reading Steering Toward Normal was like I was visiting the State Fair back in Maryland, with a behind the scenes tour. I enjoyed and grew a better appreciation for what it takes to raise a prize winning steer. A wonderful story about family, loss, letting go, and well the title says it all, "Steering Toward Normal". Included at the back of the book is information about 4-H, how ribbons are awarded at the fair, various terms and tools used with livestock and my favorite the "prank-steer guide." Favorite line, "A door that's shut too long gets hard to open. It's better to leave it cracked a couple of inches." In his eighth grade year, Diggy Lawson raises a steer for a 4-H competition while coming to terms with the discovery that his father has another son. This wonderful upper middle grade novel tells a touching family story, but without drowning its readers in sentimentality. Diggy’s love for his father, his steer, and later, for Wayne, the brother he never knew about, are the driving forces of the story, presented realistically and with a heavy This review also appears on my blog, Read-at-Home Mom. This wonderful upper middle grade novel tells a touching family story, but without drowning its readers in sentimentality. Diggy’s love for his father, his steer, and later, for Wayne, the brother he never knew about, are the driving forces of the story, presented realistically and with a heavy dose of humor. The story is structured based on the growth of Diggy’s steer, which helps the plot unfold naturally and logically, and Diggy himself is such a well-rounded character, the reader sympathizes with him instantly and finds many reasons to root for him, both in the 4-H contest, and in life. The supporting characters in this book are a colorful bunch, the kind of characters who could make readers want to live inside this book. Chief among these is Pop, Diggy’s delightfully immature 30-something dad whose parenting style involves more practical jokes than true discipline. Steering Toward Normal, while especially appealing to 4-H members, is by no means restricted to kids who raise their own animals. Diggy’s emotional journey as he makes peace with his dad’s past, his mother’s choices, and his new brother’s presence, is a story any reader can appreciate, and one well worth making available for readers ages 11-14. Diggy is looking forward to his year: he plans to raise the best steer in the county. No, check that, the state! His life, however, gets turned upside down when Wayne is dumped at his doorstep and he discovers this townie is actually his half brother. Life gets even worse when Wayne decides he, too, is going to raise an award-winning steer, though he's never worked with animals in his life. Diggy fluctuates between being sympathetic and outright angry with Wayne, all the while caring for his cal Diggy is looking forward to his year: he plans to raise the best steer in the county. No, check that, the state! His life, however, gets turned upside down when Wayne is dumped at his doorstep and he discovers this townie is actually his half brother. Life gets even worse when Wayne decides he, too, is going to raise an award-winning steer, though he's never worked with animals in his life. Diggy fluctuates between being sympathetic and outright angry with Wayne, all the while caring for his calf, who he named Joker. The year flies by, with a variety of adventures and mishaps, culminating in the showing of the calves. Diggy Lawson is looking forward to his eighth-grade year. He has a great calf to raise to compete for a top prize at the Minnesota State Fair. He has great friends at school and in 4-H, where he gets to spend a lot of time with July, the girl he has a secret crush on. He and his dad, Pop, have a great time together, just the two of them. (Diggy's mom had left when he was a baby.) But the wheels start to come off when a guy from school, one Diggy hardly knows, Wayne Graf, is tossed out in their Diggy Lawson is looking forward to his eighth-grade year. He has a great calf to raise to compete for a top prize at the Minnesota State Fair. He has great friends at school and in 4-H, where he gets to spend a lot of time with July, the girl he has a secret crush on. He and his dad, Pop, have a great time together, just the two of them. (Diggy's mom had left when he was a baby.) But the wheels start to come off when a guy from school, one Diggy hardly knows, Wayne Graf, is tossed out in their driveway by his father and told he should live there with his real father. This was news to Diggy and not very good news. Wayne's mother, who had been Diggy's third-grade teacher, had recently died. Now this! Sure Diggy felt sorry for Wayne, but that didn't mean Diggy wanted to share his life and his Pop with Wayne. To top things off, Wayne decides to get a calf of his own when he finds out the prize for Grand Champion is huge. AND July seems to pay a LOT of attention to Wayne now. So does Pop. Suddenly it seems to Diggy, he is on the outside looking in. A story that is about the heart and depth of family set against the backdrop of a 4H kid and his steer. I kind of hate the whole boy book, girl book thing, but the story of Diggy, his news-to-him half-brother Wayne, and the man who fathered them, Pop, has lots of grit and gusto that I think will appeal to boy readers. Not that there isn't plenty for girls, too. But between the hilarious pranks, the raising of Joker and Fang, and Diggy's model rockets, there's a bunch of great boy interest stuff A story that is about the heart and depth of family set against the backdrop of a 4H kid and his steer. I kind of hate the whole boy book, girl book thing, but the story of Diggy, his news-to-him half-brother Wayne, and the man who fathered them, Pop, has lots of grit and gusto that I think will appeal to boy readers. Not that there isn't plenty for girls, too. But between the hilarious pranks, the raising of Joker and Fang, and Diggy's model rockets, there's a bunch of great boy interest stuff in this book. If you had told me that I'd fall for a book with a bunch of steers in it--and all sorts of 4H stuff, too--I'd have said you were crazy. But Rebecca Petruck's novel, STEERING TOWARD NORMAL, is so much more than a book about raising steers, and I couldn't put it down! Diggy Lawson is serious about winning the state fair, and that means he must devote all his time to getting his steer prize-ready. So when his half-brother Wayne shows up, he doesn't have time to fool with him--or all the issues he dr If you had told me that I'd fall for a book with a bunch of steers in it--and all sorts of 4H stuff, too--I'd have said you were crazy. But Rebecca Petruck's novel, STEERING TOWARD NORMAL, is so much more than a book about raising steers, and I couldn't put it down! Eighth-grader Diggy Lawson has a plan for the year - raising a prizewinning 4-H steer for the county fair. But when a classmate's mom dies, Diggy learns that the classmate is actually his half brother, who comes to live with Diggy and his (their) father. Diggy isn't thrilled with this arrangement. I loved so much about this book - the writing was excellent and I found myself rereading sentences to let them sink in. The relationships were well developed and so believable. The parts about grief an Eighth-grader Diggy Lawson has a plan for the year - raising a prizewinning 4-H steer for the county fair. But when a classmate's mom dies, Diggy learns that the classmate is actually his half brother, who comes to live with Diggy and his (their) father. Diggy isn't thrilled with this arrangement. I loved so much about this book - the writing was excellent and I found myself rereading sentences to let them sink in. The relationships were well developed and so believable. The parts about grief and loss are heart rending and never heavy handed. There is also a ton of humor in this book which I loved! Th details about 4-H, raising steers, and rocketry were fascinating and enriching. Rebecca Petruck's Steering Toward Normal is a well written debut (mature) middle grade book. This book deals with issues of resentment, anger, grief, alcoholism, abandonment and rejection while incorporating practical jokes, teenage crushes (the hair gel scene cracked me up) and 4H. The more mature aspects of the story are handled very well by the author, and I appreciated the appropriate lack of details regarding the adult behavior that led to the family situation. A great read for the more mat Rebecca Petruck's Steering Toward Normal is a well written debut (mature) middle grade book. This book deals with issues of resentment, anger, grief, alcoholism, abandonment and rejection while incorporating practical jokes, teenage crushes (the hair gel scene cracked me up) and 4H. The more mature aspects of the story are handled very well by the author, and I appreciated the appropriate lack of details regarding the adult behavior that led to the family situation. A great read for the more mature middle/high schooler (and those of us adults who still appreciate a well written story no matter what the target audience). I confess...I picked up this book in the library because I liked the cover. Who can resist a cow with its tongue sticking out? But early into the book it became very clear the story was about a lot more than livestock. Debut author Petruck addresses topics ranging from death, alcoholism and sibling rivalry, among others, with such skill and obvious talent while educating the reader about the ins and outs of 4H. What a clever concept. I will be anxiously awaiting future books from this author. I love it when a book has a strong sense of place, and I definitely got that in STEERING TOWARD NORMAL. Set in a small Minnesota farming community, this book taught me more about cattle, 4-H, tractors, and plenty of other aspects of rural life than just about anything I've read before. Add in some great characters (both human and bovine! ), humor, and a truly emotional storyline, and I was hooked. I also particularly appreciated the ending; it could have been very pat and tidy, but I like that th I love it when a book has a strong sense of place, and I definitely got that in STEERING TOWARD NORMAL. Set in a small Minnesota farming community, this book taught me more about cattle, 4-H, tractors, and plenty of other aspects of rural life than just about anything I've read before. Add in some great characters (both human and bovine! ), humor, and a truly emotional storyline, and I was hooked. I also particularly appreciated the ending; it could have been very pat and tidy, but I like that the author made some tougher (but more realistic) choices for her characters. I read an ARC of this sweet book with complicated family connections. Rebecca Petruck has woven Diggy's story with many threads that will touch young readers and adults alike. Diggy, the main character, has to deal with raising a prize-winning steer, coming to terms with shifting family dynamics, and the usual relationship changes brought on by puberty. We feel Diggy's frustration with things beyond his control, and admire him for learning to handle them. A great read. I really did feel invested in Diggy's life, and his and Wayne's experiences. I would recommend this to upper middle grade readers. The story entails a lot of past family issues. I think some kids could really relate. I learned a lot about showing steers at fairs. I'm still not sure I understand why a steer has to look so nice, and get sprayed with shiny stuff and have its hair styled! I think the part about kids taking such good care of the steers is great though. That is hard work! I read the ARC. It's a well-written story about the relationship of two boys, their fathers, and their steer. It has humor and heartbreak, and does an excellent job of describing upper-middle graders/young teens. Refreshingly, it's set in a rural setting without being off the grid. An impressive debut. A moving novel about what it means to uncover long buried family secrets. With the well-drawn backdrop of steers and 4-H club, Diggy and Wayne learn what it means to be real brothers and find a new "normal." Rebecca Petruck is the author of BOY BITES BUG (May 2018) and STEERING TOWARD NORMAL (2014), both with ABRAMS/Amulet. BUG received a starred review from ABA Booklist, who said it’s "...funny, perceptive, and topical in more ways than one." SLJ called it "a sure bet for reluctant readers." Kirkus Reviews said it "...successfully weaves together such important themes as bias, solidarity, and coming Rebecca Petruck is the author of BOY BITES BUG (May 2018) and STEERING TOWARD NORMAL (2014), both with ABRAMS/Amulet. BUG received a starred review from ABA Booklist, who said it’s "...funny, perceptive, and topical in more ways than one." SLJ called it "a sure bet for reluctant readers." Kirkus Reviews said it "...successfully weaves together such important themes as bias, solidarity, and coming to recognize one's own privilege and prejudice, delivering them in a plot that is so very middle school (bugs! sports!)... An admirable feat that entertains even as it instructs." STEERING TOWARD NORMAL received a Best Book of the Year Blue Ribbon from the BCCB, and was an American Booksellers Association New Voices selection as well as a Kids Indie Next List title. It also was featured in Vanity Fair's Hollywood, the L.A. Times, the Christian Science Monitor, and ABC Best Books for Children.